The first version of this song – D362, almost certainly dates from April 1816. This second version is dated November 1816. Neither song is to be found in the Peters volumes, which accounts for the fact that they are seldom, if ever, to be heard in recital programmes. At first glance one wonders why Schubert bothered to return to a poem for which he had already provided an attractive and genial setting. However, as cheery as the first version is, the second is more memorable, and has a stronger character. Schubert’s decision to try again seems justified. The first version was for tenor, in the key of A major. The second is in E major, and suits the bass-baritone tessitura; there is a substantial Vorspiel, and a complete recasting of the melody. Where the first version has a cheeky charm and suggests a young man, Schubert has made of the second a vehicle for someone who sounds older and richer in experience – a Falstaffian philosopher whose girth is suggested by the vocal range – and a slightly portly gait to the music raises a smile. This is a mini-portrait of a homespun philosopher, conceived as if it were a cameo role in an opera (like Mozart’s Bartolo or Curzio). The first setting is less highly characterized, but here we can sense Schubert’s enjoyment of a person of his own creation: slightly ponderous, self congratulatory, but still somehow loveable and endearing. He is a relation of the solitary man by the fire in Der Einsame, a real character in an uneventful domestic drama. That song, written a decade later, is more poignant; but Zufriedenheit also hymns the virtues of Biedermeier life at the same time as incorporating the composer’s amused smile in observing it. 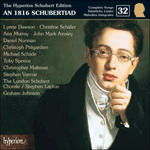 At moments like this, where music allows the ‘little person’ to live unfettered in his own world, Schubert’s genius appears even more than usually Shakespearean. There is a hint of orchestration in the introduction: bouncing strings and winds in the right-hand quavers, slower horn-calls in the descending thirds and sixths which stretch out in the left. These are almost gestural, as if a self-satisfied yawn at the ambitions of others. We are about to hear wise words, but we are made to wait for them as the protagonist gathers his thoughts. Musical flourishes (stately old-world mordents, like dance steps executed by limbs creaky yet gallant) suggest introductory bows and niceties. We arrive at a cadence in the tonic which is comically extended for two further bars, a last-minute clearing of the throat by someone who is about to hold forth. As the voice enters with a G sharp on ‘Ich’, the accompanying seventh chord on A sharp – an upbeat to a 6-4 chord in E major – accentuates self-importance; the harmony pauses in mid-suspension and calls the whole assembly to attention. The jump of a sixth down to a low B for ‘bin’ denotes gravitas. At ‘im Siegeston’ voice and piano are doubled in a rising arpeggio as a metaphor for battle or manly endeavour. The phrase ‘mit seiner Kron’ und Szepter ist es nicht’ is punctuated by the strutting right-hand motif that has opened the song. The vocal descent down to a low B at ‘ist es nicht’ implies a throwaway shrug of dismissal. The setting of the strophe’s last two lines is interrupted by a delicious interlude of suspensions in minims; the singer needs time to think of the next line, or perhaps he is taking a draw on his pipe. In any case he is making us wait to hear his conclusion with all the flair of a pub rhetorician. When this comes (at ‘Mag er’s! so ist er, was ich bin’) the musical phrase starts unaccompanied, and unexpectedly high in the voice, a throwaway line in a different register, registering indifference. The subsequent strophes are not quite so neatly tailored to the music. It is not clear whether the introduction is included in the da capo, or whether the singer is meant to go back straight to his next verse. In this performance of four strophes we offer a compromise: the delightful introduction is heard twice, and on two occasions the strophes are connected without an interlude. 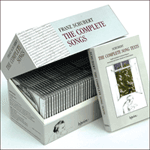 This song was transposed into G major (D501, second version) for its appearance in the Therese Grob songbook, a collection of songs which Schubert put together for the young singer’s birthday in November 1816. Therese might have been able to sing it in this key, but such an upward transposition robs the music of its essential character. Although hardly suitable for female voice, Schubert might have wanted Therese to take the text to heart, particularly if it was true that the composer’s lack of financial prospects was the reason for their parting as sweethearts. Und wär’ er’s auch; nun, immerhin! Mag er’s! so ist er, was ich bin. Zum Mond hinauf sah noch? Was hülf’ mir Geld und Ehr? And even if he is, well, all the better! Let him be: he is as I am. the good fortune of – what was his name? still gazed up at the moon. I prefer to smile at it. To be content, that is my motto! What use would I have for wealth and honour? they are still not satisfied with it. shuns no creature and fears nothing.